Ah, electricity. Invisible and unappreciated until it’s gone. Like most of the west coast, we here in South Beach, Oregon got hammered last week by back-to-back storms. Rain came down in sheets while wind did its best to rattle everything loose. On Thursday, everyone was talking about the big storm that was coming. When I woke up to blue skies, I rushed out to finish my Christmas shopping and maybe take myself out to lunch before the storm hit. While I was in the checkout line at Fred Meyer’s in Newport, I saw people coming in huddled in wet coats and knew the storm was starting. Folks were talking about getting over the Yaquina Bridge before it was closed. Forget lunch. Time to get home. Rain spattered the windshield harder and harder as I drove south. Wind gently nudged the car as I crossed the bridge. But it wasn’t bad. I still had power to warm up my leftover pizza, to read by while I ate it, and to finish my work at the computer. The lights flickered. I closed my files, but Facebook grabbed my attention until suddenly, silently, the computer screen went dark. Oh. It was 2:12 p.m. Twilight outside, twilight inside. All the little green and red lights on my various equipment were out. The pellet stove, which runs by electricity, had stopped. The only sound was the rain on the skylights and wind thrashing the trees. Okay. I had a plan. Power failures are not unusual around here. I have flashlights in every room, a large supply of candles, and two electric lanterns. I have wood for the wood stove in the den. I have cold food to eat, plenty to drink. One never knows how long the power will stay out around here. Once it lasted two days. An area farther south stayed dark for almost a week. Since I couldn’t work at the computer, this was my opportunity to wrap my Christmas presents. So I did, with loud music playing from the battery-operated radio I keep handy for storms. The sound is tinny, but it’s company. I wrapped and wrapped until it got so dark I couldn’t tell blue ribbons from green. Now it was lighter outside than in. The rain had stopped and the wind had slowed, so I took Annie out for a short walk. Soon we heard the chatter of a radio from an emergency vehicle and came upon the source of the power failure. A giant tree on the next block had fallen into the power lines. Rain-suited crews from the electric company had cut up the tree and were now restringing the wires from the highway to the street that connects with mine. Big trucks. Bright lights. Noise. “Thank you for what you’re doing!” I called. “No problem,” a guy hollered back. Satisfied that eventually the lights would come back on, we turned back home, running into our neighbor and her children coming to see what was going on. We’re all nosy. I had thought I would work on my Christmas cards, but darkness in the woods is truly dark, not like back in suburbia where night is only slightly different from day. 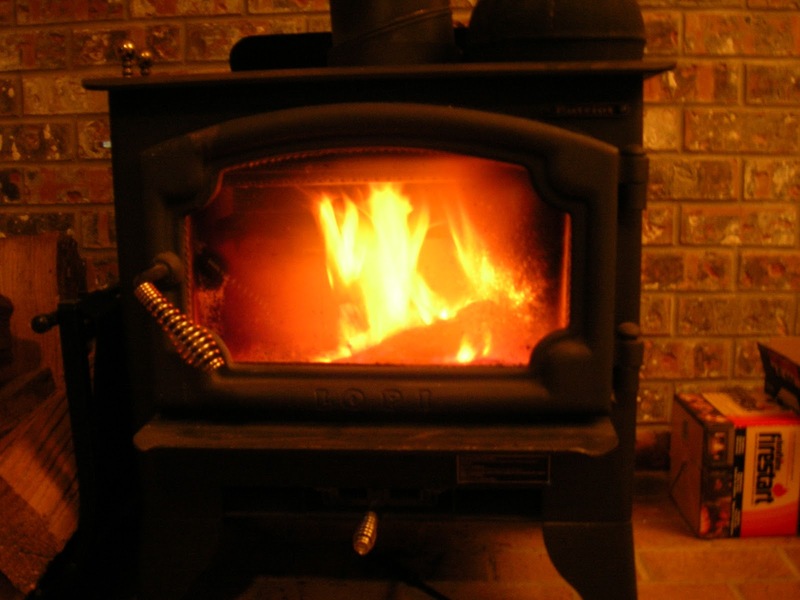 Instead, I talked to a friend on my cell phone, then settled in front of the wood stove to build a fire. Big logs, little logs, kindling, building from a spark to an orange finger of flame to a roaring fire. I sat back and watched the fire, all other duties canceled due to darkness. I thought about the days before electric lights. Even with candles and lanterns, the light is limited and full of shadows. You cannot see to do anything intricate. If you spill or drop something, it’s difficult to see where it went. It’s hard to stay clean. And surely you go to bed much earlier because it’s so dark. 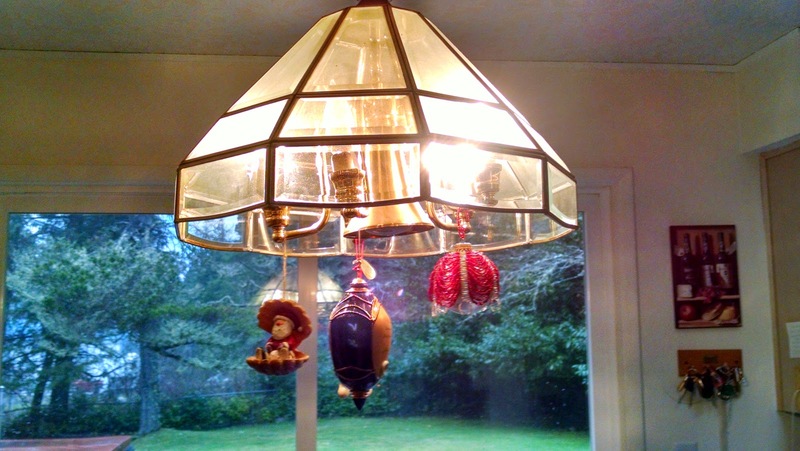 Electric lights have changed the way we live our lives. Natural light has become irrelevant. Many people work round the clock under artificial light. If we need more light, we just plug it on and turn it on.We forget how easily that light could disappear. It’s not just light I was missing. I would not be able to heat my food. The food in the refrigerator would spoil if the power stayed out. My cell phone would lose its charge, the house would cool down, and I would not be able to watch my TV shows. But I could adapt. Luckily, I didn’t have to. At 6:00, just as I was about to make a ham sandwich for dinner, the lights came on. “Yay! Thank you!” I shouted as I hurriedly threw a fish in the frying pan and a potato in the microwave before the electricity changed its mind. Despite predictions of 90 mph gusts, it turned out to be a pretty average winter storm here. We just had a few trees and branches down. In Newport, the big sign outside Bank of America blew down. In Portland, a tree fell on a car, killing the people inside. California had flooding and mudslides. But here in South Beach, we just had a little electricity-appreciation lesson. How is your weather? Any storm damage? Please share your stories in the comments.